I recently had the pleasure of visiting the newest school in the Niagara Falls school district (DSBN). The Academy was born out of the recognition that education plays a vital role in helping children to overcome the effects of life’s challenges. The comprehensive social and academic support provided by the DSBN Academy will be key to empowering students to become the first in their families to graduate from a post-secondary institution. The school opened in September with a cohort of grade 6 and 7 students and will add a grade each year until a full 6-12 student body is in place. From the start of the day where Principal Tom Reynolds greeted every student as they came through the main doors and they, in turn, greeted me (and many of the staff members) with a firm handshake and a cheery good morning, through their recognition of me as I visited their classrooms, and concluding with their deep and meaningful questions and comments when I spent 45 minutes with them in an assembly, I was very impressed with what has happened in the first few months of the school’s existence. Make no mistake about it – the students at the Academy come from a variety of backgrounds and little of their experience to date included success at school or aspirations of continuing beyond fleeting thoughts of high school graduation. You can always count on kids for the unvarnished truth and I was humbled by both their public and private comments that reflected some real struggles and some forming dreams. I was also impressed by the creed (listed below) that formed the basis of what the collective group is striving for. It’s a vision shared equally by staff (they had to apply to be a part of the school), parents (they had to endorse the move and provide volunteer hours at the school) and the students (they had to summon a courage to commit and demonstrate an ability to shed some of the negative labels and experiences that had dogged them to this point). We are the young men and women of DSBN Academy. We strive for excellence not because we say it but because we work hard for it. To guide and teach us through our triumphs and tribulations. We never succumb to mediocrity, uncertainty, or fear. We never fail because we never give up. We choose to live honestly, respectfully, and optimistically. We respect ourselves and in turn respect all people. We have a future, for which we are accountable. We have a responsibility to our families, our community, and our country. We are our brothers’ and sisters’ keepers. We believe in the DSBN Academy. We Believe and We will Achieve. After the assembly I was touched to receive an Academy T-shirt and a statement from the student leadership that I was now part of the team. I look forward to maintaining contact with the school as it continues to grow and flourish. In my short time there I was moved by many individual students and felt a strong bond with the adults as they worked together to alter outcomes. Tom and his team continue to espouse (and model) the belief that all who enter the school will be successful. I saw evidence of this when I visited a class during mentoring time. The conversation turned to getting good grades (A’s and B’s) and why that was important. Rather than hearing some of the traditional responses I have heard around ranking and sorting or some sort of status, it was all about putting oneself in a position to receive funding for post secondary and that this was available to all of the kids at school. I have been fortunate as a presenter to receive some great positive feedback after a presentation. It all pales when I reflect on the grade 6 Academy student who patiently waited after the assembly and mustered the courage to address an adult he only recently met. I kneeled down so our eyes could meet as he said, in barely a whisper, “You rock! Thanks”. Another one of those visits where I left richer than when I arrived. 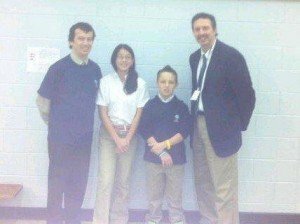 Students Olivia and Connor with Principal Tom Reynolds and the author who is proudly wearing his new Academy T-shirt. The creed makes me cry every time. My daughter is applying for this school for 2012/13. We attended an information meeting and had a tour of the school. Seems like a great opportunity. We’re both excited for her to apply. Thanks Amy. I appreciate you taking the time to send a message and wish you and your daughter the best in your application to become a part of this school.